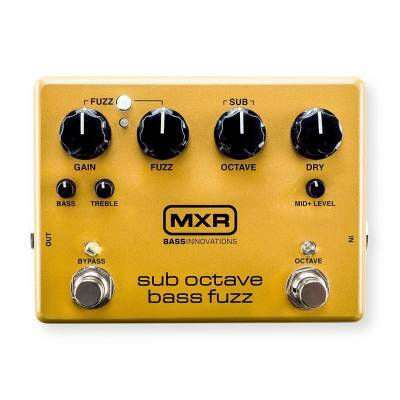 The sub octave bass fuzz dishes out thunderous low end with earth-shaking fuzz. To create this sonic behemoth, mar's engineers combined the growl section of the bass octave deluxe with a long-forgotten fuzz circuit. With three separate output level controls for the fuzz, sub octave, and dry signals, you can create your own recipe of subterranean tones without sacrificing any of your instruments natural sound. Further versatility comes in the form of the fuzz section?s tone controls and two switchable voices-warm and compressed or bright and aggressive-along with the mid level control, which allows you to give your dry signal some more punch in the midrange.